A condominium is contemplating installing marble flooring (Emperador). Most want it - some opposition is that the marble will scratch and stain. This lobby is in a condo with only 40 units and very little traffic (maybe 30 people a day in and out) We love the look of the marble tile (Emperador). 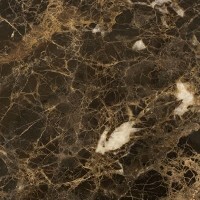 Some say granite is a better choice, but cannot find granite that has any "motion" like the marble. Please help. Need your advice. First let me praise your excellent taste! Emperador is gorgeous and will look stunning as marble flooring. I especially like the dark variety. It also happens to be one of the more durable marble varieties typically requiring less marble maintenance. Many/most people are confused about the characteristics of marble, staining, etc. 1. Staining: substance absorbs into marble causing a darker spot. can make other stones extremely stain resistant too. But theoretically if a liquid (say an oil) was able to remain on the surface long enough (a day or two) before evaporating it could absorb enough to stain. Of course, most often this just doesn't happen. Liquids evaporate and/or just dry on the surface for easy clean up on any dense or well-sealed surface. 2. Etching: an acidic or alkaline substance (food, drink, cleaner) corroding the marble flooring causing a dull and lighter colored spot relative to the marble color. 3. Scratching: marble is much softer than granite and will scratch (mainly light surface scratches) more easily than granite. This also means that a polished marble floor tile will show wear faster than granite as the polished layer is worn away from foot traffic. Although the wear comes from dirt and grit being ground into the marble and not from the friction of shoes. So, it's important to have mats inside and out to wipe off feet and minimize the wear on the marble flooring. Marble does NOT stain easy despite what you read. That's incorrect. This is the part where people are most confused. Most marble is very dense and low to non-absorbent, especially when polished. Emperador is particularly dense. It cannot be sealed. The sealer will not absorb, thus nothing else will either. Now, if you have the emperador tumbled or honed the pores are more open, so it may take/need a sealer in this case, but sealing would likely eliminate staining as a potential problem. don't need sealing and don't stain. Again, nothing is impossible to stain, but some stones are nearly so. With any stone all you need to do is perform the water test to determine how absorbent, if you need to seal and/or re-seal. However, marble DOES etch easy... in seconds in fact. People confuse etching with staining and think "marble stains easy". These are two completely unrelated issues. Sealing won't guard against etching... only against staining. More on this at the marble repair page. Luckily, emperador has a lower percentage of calcite (the component that reacts to acid resulting in etching) than most marbles and does not etch as easily. And you can test the acid sensitivity on a sample of the exact tiles you would be using by performing the lemon juice test. Good news is that etch marks on polished marble can be easily removed with Etch Remover / Marble Polishing Paste. This paste will also polish out light scratches. On honed marble it's a bit different, but still relatively easy DIY project to remove etch marks and scratches. Complete instructions are provided in the Removing Etch Marks Manual. Now marble is the traditional choice for floor tile. Most commonly with a honed surface because you don't have to worry about maintaining the polish and a honed surface will handle wear gracefully. Any stains, scratches or etch marks are also easily and cheaply removed on a honed surface. The down side with a honed marble is that the color and pattern are not as saturated and dramatic as when polished. You'd probably want to have it polished by a marble maintenance pro once a year just to keep it looking tip top, but you may not have to. Of course, a polished granite could go years before needing a tune up. Bottom line is that granite will overall be easier to maintain in top condition requiring less attention especially if you get a dark variety that either doesn't need sealing or may only require one good application because it isn't very absorbent to begin with. And you have many granites with movement to choose from. I'd agree that not many (maybe none in your opinion) can match the elegance of emperador, but beautiful nonetheless. I have interior stairs at the entry of my house, which is a split level bungalow. So basically you have to choose if you go up or go down straight at the entrance with 6 steps up and 6 down. The steps are slabs so I have to replace them and I was thinking in putting Noir St Laurent marble. We are scared about our choice for maintenance, scratches etc. I really need informations about this marble for stairs and if it's recommended. We don't have animals, no shoes insides. Thank you again!! Marble is great for interior flooring. It's best to get a honed finish both for easier maintenance and better traction. Polished marble will wear with foot traffic removing the polished layer. This requires expensive repolishing. So, a honed finish is better. Since you don't wear shoes in the house the wear on the marble will be minimal. As far as stains and etching... shouldn't be an issue on steps unless you drop a glass of orange juice on the way up or down. Probably won't happen often. I have three busy boys, and would like to do my whole house in marble. Is it the best flooring to use or should i rather go for tiles. Marble tiles for flooring are an excellent choice and aren't nearly as troublesome as a marble kitchen countertop. Marble floor tiles will wear very well, are easy to clean and floors are fairly low risk for marble maintenance issues like etching. You should install honed (vs polished) marble tiles though. It's a pain to maintain the shiny polish on marble floors and foot traffic will wear away the shiny surface in time requiring professional re-finishing. On the other hand... other types of tile flooring like ceramic or porcelain or granite do not have problems with etching (damage and dull marks from contact with acidic foods and drinks). Most ceramic and porcelain tiles will also show a better stain resistance than marble, however, marble is not very absorbent and does not stain "easy" as is commonly suggested. People confuse etching with staining thinking they are the same. Of course, they are two different issues. However, even though ceramic and porcelain floor tiles can look very nice they will never have the beauty and luxurious look of marble. And ceramic can chip and scratch easily leaving a noticeable mark. Porcelain is better regarding chips and scratches since the color can be consistent all the way through the tile, however, both are more difficult to repair than marble. The great thing about marble and natural stone is that it can almost always be repaired or re-finished to like new condition. Most man-made products are limited in the repairs that can be made and often no repair except replacement is available. If you choose to go with marble, then you'll find the Cleaning Marble Secrets ebook handy. This e-book covers all aspects of marble maintenance, protection, cleaning marble and the most effective DIY problem solver solutions.